Wet Dog In, Dry Dog Out! With the Microfibre super absorbent Doggy Bag dog towel, you can keep your pet, car and home spotless after walkies. They don't just absorb ten times more water and slobber, but sand and mud too! 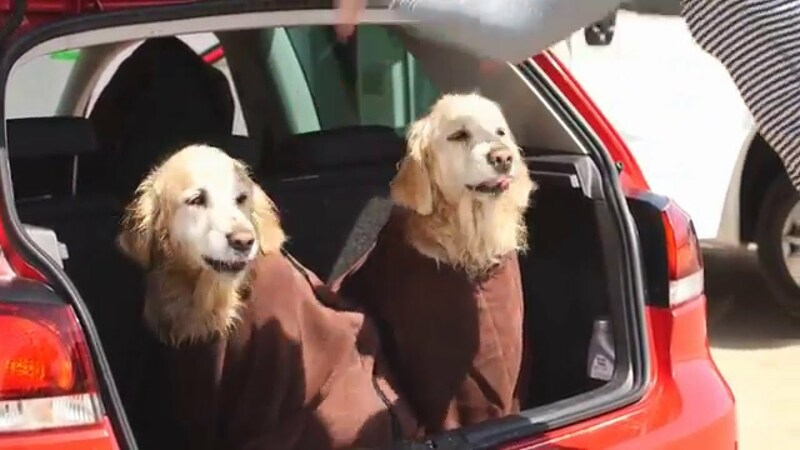 Leave this 'dry dog towel' in the car after walks, zip-up your pooch in this amazing pet towel and man's best friend will be dry before you get home! Watch the video to see how this works! NEWFOUNDLAND, ROTTWEILLER, STANDARD POODLE, ALSATIAN, GERMAN SHEPHERD, GOLDEN RETRIEVER, MASTIFF, ST BERNARD, GREAT PYRANEES, BORZOI.